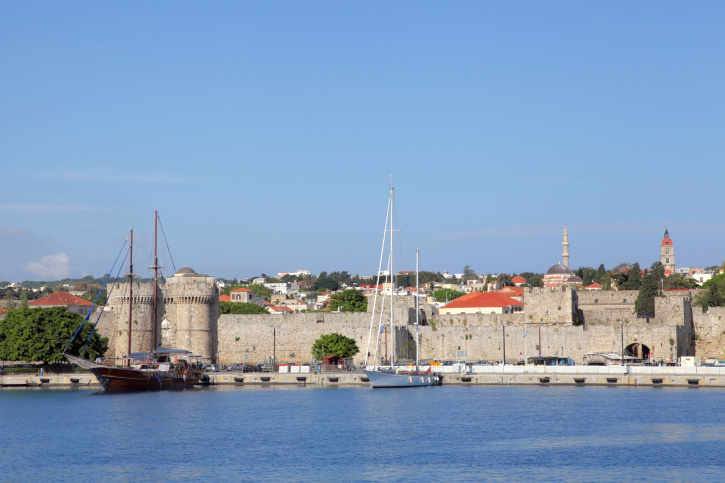 Rhodes, the center of Dodecanese trade, politics, and culture, is the fourth largest Greek island. 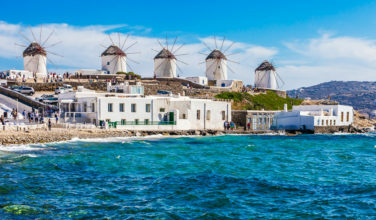 It’s a popular tourist destination because it offers an attractive combination of sights, architecture, an active nightlife, and white sandy beaches that are among the cleanest in the Aegean. Rhodes is a great spot to visit as it receives on average more than 300 days of sunshine a year. Rhodes town is comprised of two parts: Old Town and New Town. Rhodes Old Town is the high town, lower city, and modern metropolis. Its narrow streets are mostly closed to cars and are lined with churches. The Palace of the Grand Masters is at the highest spot of Rhodes town. The massive palace has more than 150 rooms. Today it houses a collection of antiques. It also holds displays and maps that show the layout of the city, which is very useful for tourists before they venture out to explore. The Thermes Kallitheas is a mosaic-style bath complex. Though the baths are no longer in use, the Rotunda has been restored and visitors can walk through the beautifully landscaped grounds. Occasionally, art exhibitions are on view. New Town spreads away from the walls of Old Town and is where most of the bars, discos, nightclubs, and tavernas can be found. It’s also where you can find Elli, the public beach near Rhodes Yacht Club. Lindos is a medieval village located 30 miles southwest of Rhodes town. A worthwhile stop during a visit to Rhodes, it is comprised of narrow, cobble streets where donkeys are the only mode of transportation. Towering above the village is the Acropolis of Lindos which offers spectacular views of the surrounding harbors and coastline. Behind the Acropolis is the Temple to Athena, the site’s most important ancient ruin. As you walk through Lindos you’ll notice the 17th and 18th century naval captains’ stone houses, many of which have been restored and are now summer homes for the wealthy. Main Beach, located east of the Acropolis, is the area’s top beach. The west coast of Lindos is more forested with fewer beaches, but it is also much less crowded and worth visiting if you are looking for a quiet retreat. 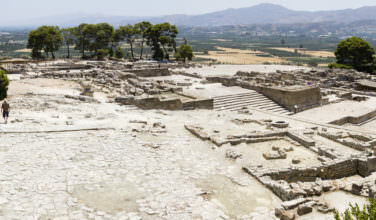 Kameiros is one of three ancient cities of Rhodes which dates to the classical period. 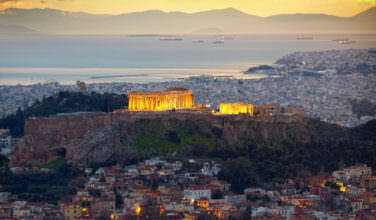 It includes an acropolis, reservoir, and streets lined with houses, shops, and temples. Kastello, the 15th century fortress, offers good views in every direction. 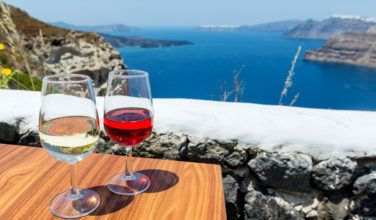 Siana is a small town known for its honey and Souma, a strong, sweet wine. Petaloudes is known as the “valley of the butterflies”. During the summer months the “butterflies” (moth species) cluster by the thousands around the low bushes of the storax plant in the area. Diogoras Airport in Paradissi is about 12 miles southwest of Rhodes town. Visitors can take the half-hour ride on a public bus or a taxi. Ferries run to and from Rhodes and other islands in the Dodecanese.